In Brazil and Mexico, ranked seventh and eleventh by the Committee to Protect Journalists as the countries with the highest levels of impunity in the murder of journalists, two advocacy groups are mapping these attacks in an effort to increase their security. In recent years, Article 19 Brazil and Periodistas en Riesgo or "Journalists at Risk" of Mexico have created maps that aggregate attacks against journalists in their respective countries. The goal is that journalists and other media workers will be able to use the site to better prepare when covering certain regions of the country. Map from Periodistas en Riesgo. While the map from Periodistas en Riesgo was first created in 2012, Article 19 Brazil launched its website, seen below, this past November. The only one of its kind, the map allows users to search for violations of freedom of expression by victim (a media worker or human rights defender), type of violation (homicide, attempted murder, death threat, kidnapping, or torture), or by location. Map from Article 19 Brazil. In 2011, the Brazilian organization began to monitor violations to freedom of expression in the country, presenting data and analysis in a series of annual reports, according to Thiago Firbida, an officer for the organization’s Protection of Freedom of Expression program. 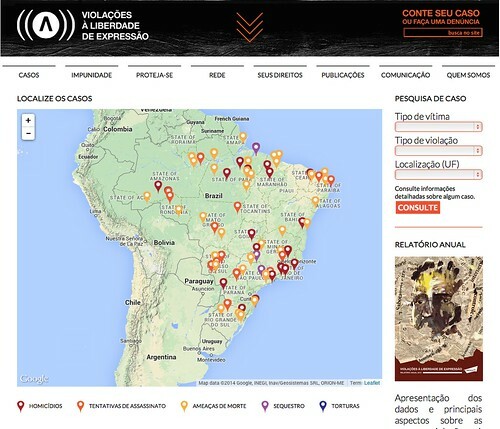 The website generates results on a map of Brazil, placing pins in the location of each violation; victims’ names and the year of the violation are also listed. For example, between 2012 and 2013, the organization recorded two death threats, one assassination attempt, and two homicides of media workers in the state of Minas Gerais. This included the March 2013 killing of Rodrigo Neto de Faria, a journalist who had been working on stories about potential police involvement in criminal activity. Two men on a motorcycle shot de Faria as he walked towards his car outside a restaurant. Article 19 Brazil gathers and verifies the data using a three-step process that includes aggregation of original reports; confirmation of details via interviews with victims, civil society members and authorities; and follow-up on possible legal action, according to the site. Currently, all information is from 2012 and 2013, but Firbida said that information from 2014 will be included in the beginning of 2015. Additionally, the site provides information, resources, and safety guides for journalists and human rights defenders, as well as a forum for journalists, human rights defenders and victims to share experiences and improve security protocols, Firbida said. The site also accepts anonymous complaints from victims of attacks. “Since we launched the website, the number of victims that came to us for help increased considerably,” Firbida said. Impunity in cases involving attacks against journalists is common in Brazil. The country ranked eleventh on the Committee to Protect Journalists (CPJ) 2014 Global Impunity Index. In a recent interview with the Knight Center, Carlos Lauria, Senior Americas Program Coordinator for CPJ, said the organization received commitments from Brazilian President Dilma Rousseff earlier this year regarding impunity in cases of violence against journalists. It is a problem that ties Brazil and Mexico, where Jorge Luis Sierra, director for Knight International Journalism Fellowships at ICFJ, created Periodistas en Riesgo in 2012. In addition to creating the map during his time as a Knight fellow, Serra has also collaborated with Iraqi journalists to create a similar site in that country. 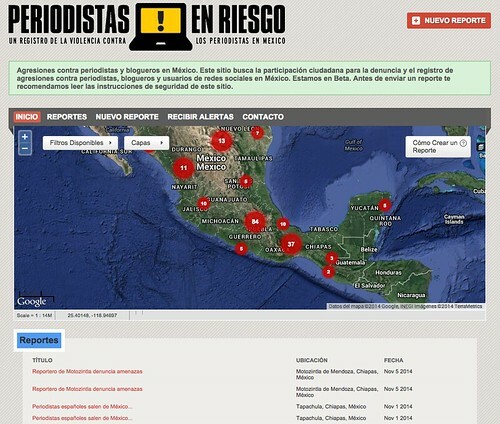 The site in Mexico tracks and documents attacks against journalists. “We try to see how different types of attacks overlap and how they manifest themselves in different regions of the country,” said Javier Garza Ramos, an ICFJ Knight International Journalism Fellow who now oversees Periodistas en Riesgo. Garza and his colleagues have noted that the nature of attacks against journalists are different depending on the region of the country. In Mexico City, journalists face beatings during social protests, mostly at the hands of the police, Garza said. During the November 20 protests for the missing students from the Raúl Isidro Burgos Rural Teachers’ College of Ayotzinapa, Garza said the organization documented six attacks against reporters in the capital. In Tamaulipas and Nuevo Leon in northern Mexico, armed groups throwing grenades or shooting at news organizations is the most frequently documented attack, according to Garza, while harassment of media workers by politicians is more common in southern Mexico. Overall, Garza said the group has seen increases in beatings during street protests, harassment from politicians, and denial of service attacks and hacking attempts on websites. Like the map created by Article 19, Periodistas en Riesgo requires reported attacks to go through a series of verifications to ensure that the attacks were carried out because of the individual’s work as a journalist. The group works to compile media stories about attacks, but also encourages the self-reporting of incidents. Garza’s group uses the map to train local networks of journalists in different cities around Mexico. The site also houses security manuals and contact information for organizations that support journalists having legal or psychological issues.